During the evaluation period, each presenter was given 15 minute-delivery time of their accomplishments, challenges encountered and priorities. Evaluators were also participative in providing feedback, comments and suggestions to encourage the department heads of offices/unit to commit on their set targets and priorities in order for the office/unit to become contributory to the progression of the University's internal and external operations. Consequently, the best presentation was awarded to the officials who have clearly accomplished all their targets. Dr. Arnold R. Lorenzo, Dean of College of Education; Dr. Christine N. Ferrer, Director of External Linkages and International Affairs; Dr. Danilo Oficiar, Director of Student Services and Development; Ms. Yolanda F. Juan, Director of Administrative Affairs; and Dr. Yolanda Guillermo, Director of Extension and Training won the best presentation award. The awarding of certificate of recognition and incentives to the best presentation took place on the last day of the planning-workshop which was held at Yellow Beach Villas, Binmaley, Pangasinan. Prior to the said awarding, the members of Administrative Council participated in a GAD Mainstreaming Seminar on the third day, July 18,2018, at the TAU Bamboo Training Center. Dr. Wilhelmina Masinsin, the GAD Coordinator of the University of Rizal System, served as the guest speaker. She discussed the GAD basic concepts, GAD mandates, and the role of HEIs in the implementation and promotion of gender equality/equity in the academic and administrative milieu. On July 19, 2018, the TAU officials travelled to the Science City of Muñoz, Nueva Ecija for a benchmarking activity at Central Luzon State University (CLSU), Philippine Carabao Center (PCC), Philippine Rice Research Institute (PhilRice), and Bureau of Fisheries and Aquatic Resources-National Freshwater Fisheries Technology Center (BFAR-NFFTC). The members of the Administrative Council believed that this benchmarking activity was very timely in establishing possible linkages and partnerships with agricultural and agriculture-based institutions. This also became a proper venue for the inquiries of the TAU officials pertaining to the best practices and programs/projects implemented and patented by these said institutions. Upon arrival at CLSU, Ms. Julieta P. Burnot of the Office of Publication Affairs welcomed the TAU officials. Ms. Burnot explained that the TAU officials may conduct the benchmarking visit at CLSU in a simultaneous manner. Thus, the members of Administrative Council created groupings for the said simultaneous benchmarking activity. The College Deans composed of Dr. Ma. Theresa B. Nardo of College of Arts and Sciences, Dr. Restituta B. Paragas of College of Agriculture and Forestry, Dr. Silverio Ramon DC. Salunson of College of Business and Management, Dr. Arnold R. Lorenzo of College of Education, Dr. Guillermo S. Rillon, Jr. of College of Engineering and Technology, and Dr. Ma. Asuncion G. Beltran of College of Veterinary Medicine conducted a benchmarking visit at the CLSU’s Academic Affairs. During their meeting with the Deans from CLSU, the TAU group learned more about the best practices of the Colleges in CLSU which are identified as Center of Excellence or Center of Development. Teamwork is the highlight of their discussion when they asked how these Colleges maintained their COE/COD status. The group also learned that CLSU has strict policy on admission and retention, thus, they have maintained high standards and quality of education. Faculty loading was also discussed as the Deans from CLSU mentioned that they implemented a maximum 18 units ETL for their faculty. The Deans from CLSU also made sure that they utilize their laboratories and field demonstration projects in instruction and even in research and extension. Meanwhile, the group of administration was composed of Dr. Noel J. Petero, Director of Planning and Development Office; Dr. Henri B. Caasi, Director of Alumni Affairs; Dr. Danilo N. Oficiar, Director of Student Services and Development; Dr. Sonny DC. Torres, Chief of ESWM; and Mr Feliciano Rosete, Jr., President of TAU United Faculty Association. They conducted the benchmarking visit at the CLSU’s Administrative Services. The Administrative Services group was welcomed by the CLSU officials and staff at the Office of the Vice President for Finance and Administrative Services. One of the topics that they discussed was the best practices of CLSU in terms of the preparation for ISO certification. They learned that CLSU had to identify an accredited certifying body for the ISO certification. Their consultation with DAP has also become evidently effective in their preparation and implementation of quality management system as prescribed by ISO. The group of RET was composed of Dr. Tessie E. Navarro, Vice President for Research, Extension & Training; Dr. Cielito A. Beltran, Director of Research and Development; Dr. Yolanda S. Guillermo, Director of Extension and Training; and Dr. Lilibeth B. Laranang, Director of Rootcrops Research and Training Center. They conducted a benchmarking visit at the CLSU’s Research, Extension and Training Services. Prior to this activity, the RET group also joined the group of IGP composed of Ms. Luningning P. Guillermo, In-charge of Housekeeping for CEC and TAU Hostel, and Ms. Loren P. Bermillo, Director of Sports and Sociocultural Development, in conducting a benchmarking visit at CLSU’s Business Affairs. The Vice President of University Business Affairs, Dr. Edgar A. Orden, welcomed the RET and IGP groups. During the visit, Dr. Orden presented the history of the University Business Affairs Program (UBAP). He also presented the composition, duties/function and responsibilities of the staff and members of the University Business Development Council (UBDC). The said council was composed of the VPs, Directors, faculty involved in the business projects, officials/project managers, financial manager, and the other concerned officials from the different support offices. This council oversees the management and monitors the development of various projects under the UBAP. Moreover, Dr. Orden explained that one of their best practices of CLSU is their process in crafting operational plan for all of their business projects. He encouraged the IGP group from TAU to initiate the crafting of operational plan so that the TAU may also develop various business projects and maximize the financial and manpower services. He also stressed the significance of giving incentives to the project leaders who have accomplished their target income within the certain production year. In this way, the project managers will be motivated to attain the target profitability of their respective projects/business programs. He was also proud to mention that all of the members of the CLSU community enjoy the profit earned from their business projects particularly the monthly ration of rice that they provide to their faculty and non-teaching staff. Meanwhile, when he was asked by Dr. Yolanda S. Guillermo about their best practice in maintaining their business projects, he simply answered that commitment and honesty must be observed amongst them. He added that it is imperative to submit their accomplishment/ financial report with attached receipts at the end of production year (at the end of the six-month period). Their reports must be based from their operational plan approved by the Board of Regents. After the benchmarking activity, the four groups of TAU officials gathered at the CLSU Umart for lunch. Upon arrival, CLSU President, Dr. Tesero A. Abella welcomed the TAU officials. After dining, the officials proceeded to the next destination. The TAU officials proceeded to the Philippine Carabao Center (PCC). The staff of the PCC welcomed them. They visited the Animal Genetic Resources (AnGR) Cryobank, the carabao milking station, Milka Krem, and other laboratories established for the research and development of the Philippine Carabao Center. The staff of the PCC also presented the thrusts, programs and services of the said institution. They also explained the mandates of the institution, and one of those is to help the farmers in generating income from the carabao meat and milk production. After the visit at the PCC, the officials proceeded to the Bureau of Fisheries and Aquatic Resources-National Freshwater Fisheries Technology Center (BFAR-NFFTC). The officials and staff of BFAR-NFFTC welcomed the group thru a short briefing of the services and programs of the said institution. Ms. Michelle Pascua explained the process of dispersal of fingerlings, conditioning and categorization of fish, commodities available in their institution, the process of fingerlings production, and even the best practices/systems of the Cryopreservation of Tilapia Milt. She emphasized that this Philippine Tilapia germplasm center at BFAR-NFFTC is the only established tilapia germplasm center in the world. After the benchmarking activities conducted by the members of the Administrative Council, they travelled from Nueva Ecija to Binmaley, Pangasinan for the team building activity. At around 9:00 in the evening, the TAU officials arrived at the Yellow Beach Villas, Binmaley, Pangasinan. The group enjoyed a fellowship dinner, a rest and recreation activity and team building activiy prepared for them. These activities honed the harmonious working relationship among the officials of the University. It was a good venue to establish best strategies in accomplishing targeted tasks. With this activity, the participants shall have a clearer concept of teamwork, equity, equality and gender sensitive/gender responsive actions. 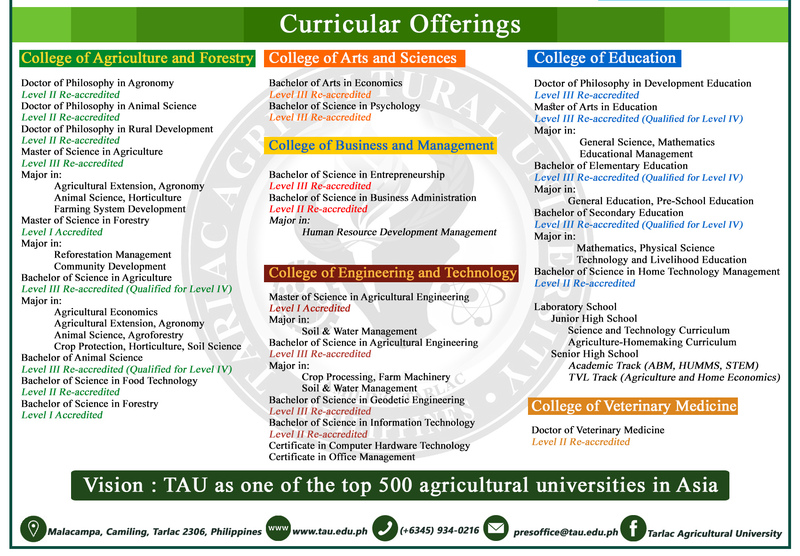 Overall, the outputs gained from the five-day activity are crucial in establishing efficiency and effectiveness of the organization’s operations through the establishment of realistic goals and objectives consistent with the University’s vision and mission in a defined timeframe within TAU’s capacity for implementation.